It’s safe to say that my dressing table is getting a LITTLE (aka. massively) overcrowded, between the masses of skincare and makeup products I now own. 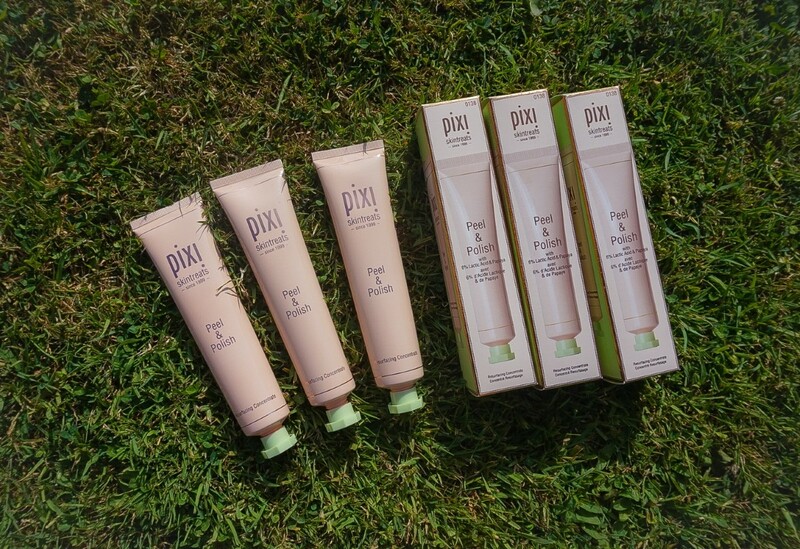 I have a selection of skincare products to talk about, but today I’m going to be focusing all of my attention on the Pixi Beauty Peel & Polish (RRP £26). Whilst I’m a Brand Ambassador, I have promised to never positively promote a product that I’m not 100% in love with, and so far, everything the brand has launched has amazed me… including this fairly new product. Not everyone can afford a celebrity-proofed, enzyme salon experience – and for those people (including myself), this product is the perfect alternative. Paraben free and cruelty-free (as with all Pixi by Petra products), the Peel & Polish contains 6% Lactic Acid and Papaya – the winning combination for smoother and healthier skin. Rather than leaving the skin red and sore, this product is a gentle alternative to abrasive peels – it gradually resurfaces dead skin cells to rejuvenate a previously lifeless complexion. One thing is for sure… you can expect quick results. Remove the product from the face with a hot flannel 2 and a half minutes after the initial application (the final 30 seconds will be spent rubbing the granular formula into the skin). Honestly? Really, really smooth and healthy looking skin. Granted, I use a combination of products (from numerous brands) and have an extremely vigorous skin routine, so that helps, but I’ve really noticed a difference after applying this. It’s so quick, convenient and can be applied 2-3 times a week for maximum results! I’ve been really curious about the Pixi brand and have been meaning to check out some of their products. I think this will be first on my list! I’ve really been wanting to try the Pixi brand – their eyeshadow palettes look amazing! Is this suitable for dry / sensitive skin? I really want to try it! Do you think oily skin girls could get away with using this? Why is it called a peel if you don’t peel it off? It’s a peel rather than a ‘peel off mask’. Basically, peels are slightly acidic to remove a layer of your skin, which can cause redness usually – however, this is a very gentle peel. Thank you I never knew that!